Easter may still be a bit far away, but since shops are already stocked up with the gooey treat that everyone adores, why wait? When we can just roll up our sleeves and bake some out-of-this-world cupcakes that will be devoured in seconds? Just make sure you buy a few extra bags of creme eggs, just in case the temptation is too big and you end up eating one to many while getting the cupcakes ready. Not that anyone could ever blame you for eating all the chocolate eggs, but you really have to try these cupcakes. I couldn’t possibly decide between lemon or chocolate icing, so l thought l better made both, and problem sorted. If you wonder how the creme eggs ended up inside the cupcakes, well, that’s easy. Make sure you use the mini Cadbury creme eggs, rather than the standard size, as those are too big to fit inside the muffin tray cups. And we really want them to be covered completely with batter before placing them in the oven. Otherwise, the chocolate eggs will not keep their shape and will melt while baking. That would be such a disaster! Another thing you must be warned about is that you really have to freeze the creme eggs well before using them. Again, that will prevent them from melting in the oven. Just a few hours should do, but ideally overnight. Once the cupcakes are baked, the eggs will have the right shape and consistency. Childish as it may sound, cutting the cupcakes in half to reveal the hidden creme eggs is so exciting. It’s like opening a Kinder surprise egg, you can’t wait to see what’s inside. 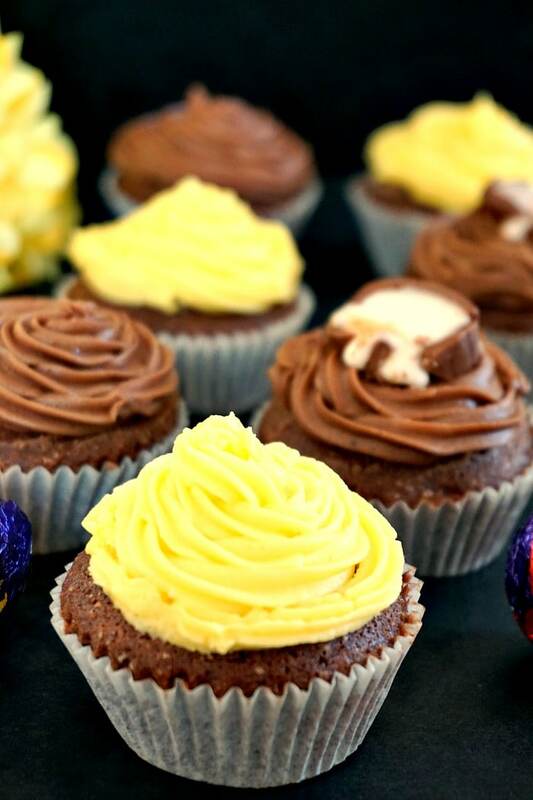 How do you make creme egg cupcakes? Before you begin, make sure you ingredients are at room temperature. We need the butter to be soft (but not melted) when we beat it together with the sugar. Once we add the eggs, you will see the nice paste curdles a bit. Not a worry about that, the batter will still be ok.
Just add the flour and the remaining ingredients, and it should be absolutely fine. If you don’t use cucpcake paper cases, make sure you grease the tin well with butter, otherwise they cupcakes will stick to it. Once the cupcakes baking, you can make the icing, both lemon and chocolate flavour, or any other flavour you like. If you have kids, they will just love it! How not to love Easter! I don’t mind Winter and cold that much, l guess every season has its own beauty, but l absolutely love Spring time and Easter. After all the gloomy winter days, the joy of Spring is priceless. I really feel like l’m a different person altogether. A bit of sunshine and green can make. And a good cupcake too! 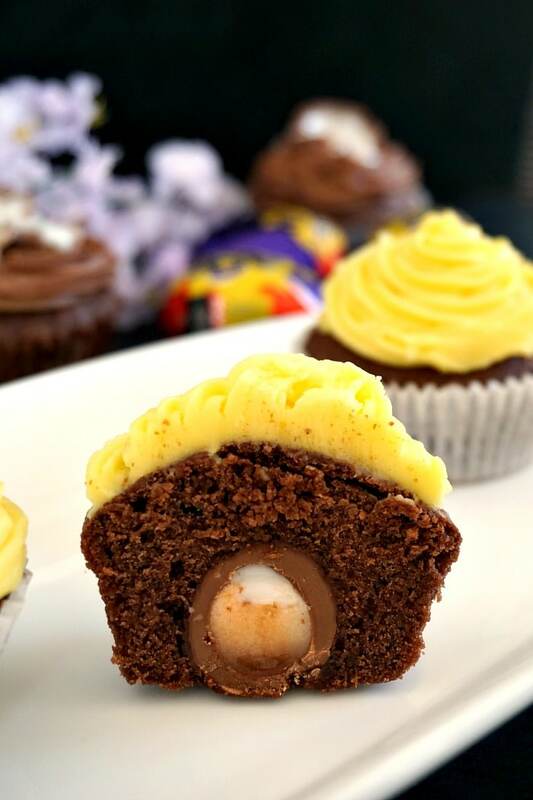 If you’ve liked my CADBURY CREME EGG CUPCAKES or any other recipe on the blog then don’t forget to rate the recipe and let me know how you got on in the comments below, I love hearing from you! 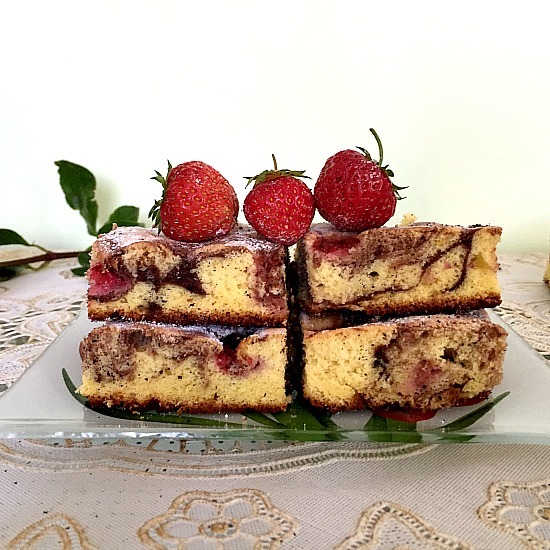 You can also FOLLOW ME on FACEBOOK, and PINTEREST to see more delicious food and what I’m getting up to. 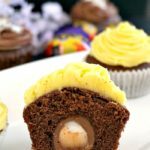 Cadbury creme egg cupcakes with a delicious chocolate sponge and a fantastic choice of chocolate and lemon icing, the best Easter treat ever. Freeze the mini creme eggs for a few hours, ideally overnight. Beat the butter and sugar until you get a smooth consistency. Gradually add the eggs one by one and continue to beat until all incorporated. Do not worry if it curdles at this stage, this is absolutely fine. Add the flour, cocoa powder, salt and lemon extract and mix them all gently with a spatula. 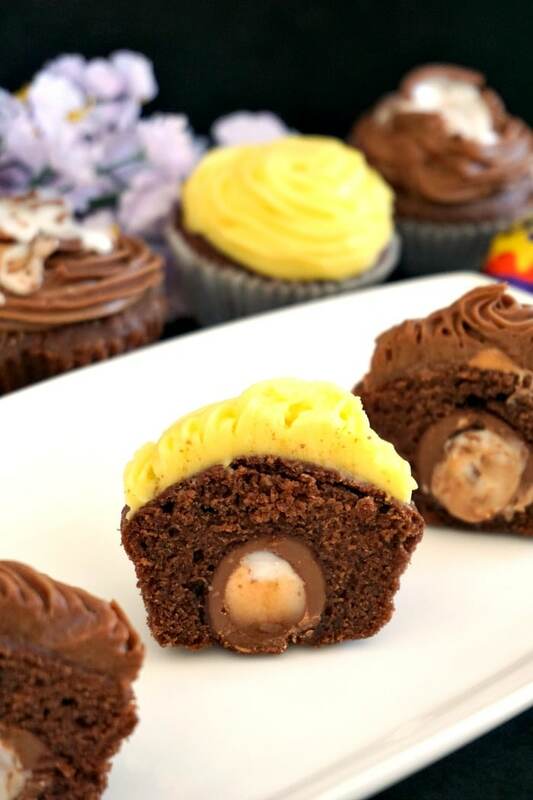 Line a cupcake/muffin tray with paper cases, scoop out a teaspoon of batter in each case, then add one mini creme egg. Cover the eggs with more batter, making sure the batter is divided evenly between each case. Bake it the preheated oven at 180 degrees Celsius for approximately 20 minutes or until well risen and firm to touch. To make the yellow icing sugar, beat all ingredients until you get a smooth paste. Same applies for the chocolate icing. Using a nozzle of your choice, pipe the icings on the cupcakes. Cadbury creme eggs used to be my favorite Easter candy! I just think this is such a great idea how you’ve put it as a surprise in a cupcake! This is just darling great idea to use those leftover chocolates or for a special treat with a surprise for kids and adults on Easter day. Cute cupcakes for Easter. Perfect to take along, or serve as dessert. Even the Easter Bunny could deliver these too. Did I see some cupcakes with extra Cadbury creme eggs cracked open on top? I love that idea! Oh,yes! Since we are indulging, we may as well do it in style ? Ha! I love these cupcakes! Growing up Cadbury eggs were my favorite Easter candy. Jelly beans meant nothing!!! These cadbury cream cupcakes perfect for Easter. I need to make some for my kids, I will try this recipe. Oh my goodness, this sounds like the best idea EVER, haha! Sounds amazing. My hubs would really love these! We are huge fans of cadbury as my hubby is from England!! I have to make these fabulous cupcakes for them as I know we will all enjoy these!! My family loves Cadbury Eggs! I bought five bags last Easter and we devoured them in no time! Add them to cupcakes? Now that sounds like a genius plan! Love it! these cupcakes look perfect for easter and also a great way to use all those chocolate eggs. Love the idea of adding the Cadbury egg as a surprise inside. I haven’t had a creme egg in YEARS! I love that you baked them into cupcakes – what a lovely surprise for Easter! Chocolate and candy in a cupcake. Delicious. I can totally see this at any spring tea. What a beautiful surprise inside the cupcake and the kids would go crazy about this. So perfect for Easter. I am making these for sure this year. Thanks for sharing with us at the Blogger’s Pit Stop Yummy looking cakes yummmm! Would you be able to freeze these or would this make them go funny? Hi Carly! I’m sorry, l have never tried to freeze cupcakes, so l can’t tell if they would freeze well. Definitely, l wouldn’t freeze the icing anyway. But l think they are at their best freshly baked, so l wouldn’t freeze them at all. They would however last ok in the fridge for a day or two, in case you need to make them in advance. Would these be ok to freeze do you think? 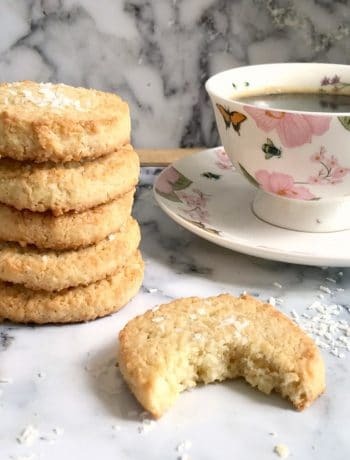 Are these okay to bake without baking powder or sofa?